For 30 years, the Jazz Foundation of America has been dedicated to keeping jazz & blues alive in America. Members include those who've played with artists such as Duke Ellington and Billie Holiday, to Jimi Hendrix and The Rolling Stones. The Foundation embraces more than 7,000 musicians annually, addressing issues such as health care, housing and disaster relief, and spreading the gospel of jazz and blues in classrooms, senior care facilities and one-on-one education. 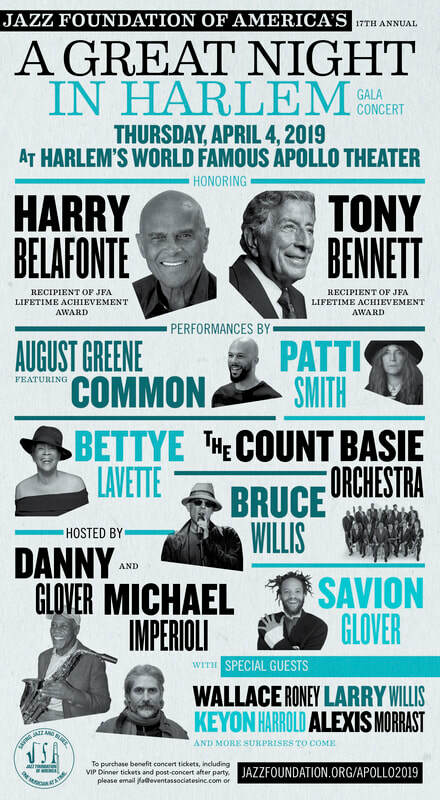 The annual “A Great Night in Harlem” at the Apollo Theatre, now in its' 17th year, features legendary musical icons, thrilling moments of jazz music and real-life stories of musicians saved by the Jazz Foundation. Its' goal is simple and challenging - raise the funds necessary to continue to treat their members with dignity and respect.